During her early research on patient safety over a decade ago, focusing on medical error disclosure and ways to improve communication with patients and families after harmful events, Sigall K. Bell, MD, director of patient safety and quality initiatives for the Raskin Fellow in Medical Education at Beth Israel Deaconess Medical Center, began to notice a pattern. “I started noticing that some of the stories of harmed patients and families shared a common narrative: ‘I knew something was wrong, but I couldn’t say anything’ or, ‘I didn’t know how or who to tell’ or, ‘I tried to say something, but it didn’t work.’ This resonated with themes we heard from interviewed patients and families who experienced medical error, which included a sense of guilt: ‘If only I had been there,’ or, ‘If only I had said something,’ ” Bell recalls. As it turns out, clinicians may be overlooking, if not actively discouraging, input from a significant patient safety resource: patient caregivers. In an article published July 2018 in BMJ Quality and Safety, Bell and her colleagues present numbers to back up these anecdotes. The team found that in a survey of family members of ICU patients, significantly more than half were hesitant to speak up about possible mistakes, mismatched care goals, confusing or conflicting information, or even inadequate hand hygiene. In their article “Speaking up about care concerns in the ICU: Patient and family experiences, attitudes and perceived barriers,” Bell and her fellow researchers surveyed 125 ICU families at the Beth Israel Deaconess Medical Center, and supplemented that information with a national internet sample of 1,050 individuals with prior ICU experience. Among the ICU families, 50%–70% expressed hesitancy to voice concerns around surveyed areas. Results among prior ICU participants were similar. Half of all respondents reported at least one barrier to voicing concerns. Most commonly, they did not want to be seen as a “troublemaker.” In other cases, they felt the team was too busy or they simply didn’t know how to express these concerns. Hesitation from family members is a real problem for clinicians, who could be losing a valuable partner when caregivers are reluctant to speak up. “Engaging caregivers in conversations what’s going on with the patient and their treatment options, and answering their questions about the treatment plan is really important because it can help guide you as a provider,” says Hanan J. Aboumatar, MD, MPH, director of the Johns Hopkins Armstrong Institute Center for Engagement and Patient-Centered Innovations and Core Faculty. For starters, those conversations provide clinicians an opportunity to prepare a caregiver on providing necessary treatment to the patient and emphasizing the importance of sticking with the treatment plan. This research set forth the idea that in an era of emphasizing patients as part of the safety team, safety culture should include a focus on creating an environment that allows patients and families to speak up about care concerns. “Anyone should be able to ‘stop the line’ when they see a possible safety problem—including patients and families. While we haven’t yet developed a ‘speaking up climate’ scale for patients and families, this study was a first step in that direction,” Bell says. 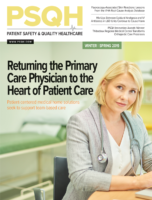 Programs that encourage physicians to speak up when something is wrong are becoming more common for healthcare organizations, particularly related to the problems that physicians and nurses face as a result of traumatic second victim situations. But this encouragement to speak up doesn’t always extend to families. “We rely on caregivers to take care of patients in the outpatient setting as soon. But as the patient comes into the hospital, we take over all care activities for the patient,” Aboumatar notes. And it’s easy to see why. For starters, Aboumatar points out, not all patients have caregivers, so the system is set up to handle all patient needs regardless of the presence or absence of a caregiver. That’s just the beginning of the barriers that must be overcome. In the ICU in particular, there’s a risk of a caregiver inadvertently harming the patient unless he or she is properly trained in how to provide care. That training demands time and resources that may not be available. “You have to answer their questions, there may be some tasks you need to supervise, so if you don’t have systems in place and tools available that will make it easier for you to engage the caregivers, then time and concern for how the caregivers may perform may be barriers to engaging them, particularly in the hospital,” Aboumatar adds. Awareness of this oversight—and the benefits patients are losing by not engaging caregivers—is likely to be the most powerful trigger to change. More healthcare organizations are looking to encourage patients and families to speak up. The MedStar Institute for Quality and Safety has a “We Want to Know” program to improve two-way communication capabilities. It aims to help patients report problems and concerns as they happen or after discharge. Through its Roadmap project, the National Patient Advocate Foundation is working to encourage communication between patients and providers, particularly on care conversations. “We suggest that in the very first appointment with a provider, both the patient and their caregiver have the opportunity to evaluate the process and outcomes of the appointment, including treatment options,” Donovan says. And The Joint Commission relaunched its Speak Up program in May 2018 to help patients and their advocates become more active in their care. The program includes videos to engage the general public. While these programs offer plenty of value to healthcare organizations looking for resources to make caregivers more comfortable in voicing patient safety concerns, there may be some simpler strategies clinicians can try first. “We know that it can be intimidating for patients to speak up to doctors, authority figures, or other experts,” Donovan says. She finds assessments to be an important tool for encouraging open communication. “Not only is the first appointment critical in establishing the treatment and protocol, but there should be assessments at every key decision point to ensure that goals are still being met and to evaluate if those goals have changed,” she says. Underscore as part of ICU orientation or other patient participation programs that families hold unique information about the patient. Develop patient education programs that enable interested patients and family members to identify patient safety hazards. Provide at the outset (before they are needed) clear instructions about how to raise concerns, such as who to speak to and how to notify clinicians about urgent issues. Prepare clinicians to respond effectively when patients speak up. This will require faculty development and strengthening of transparency culture, ensuring that patients feel heard and respected. Recognize patients and families that speak up, and celebrate their role as part of the healthcare team and safety culture. This can help reinforce organizational commitment to partnering with patients, increase the visibility of this leadership and frontline commitment, and encourage other patients and families to voice their own concerns. Encourage all providers to communicate verbally and nonverbally in a way that allows caregivers and patients to feel comfortable and able to approach them with questions, she says. This may include basic things, such as introducing yourself with a smile and explaining your role, both of which acknowledge the caregiver in the room. Try sitting next to caregivers, rather than talking with them from the hallway, so they feel you are giving them the time and attention that they need. Ask questions and give caregivers the time, without interruption, to speak up with any concerns. Put yourself in their shoes. That means “thinking about yourself in that position and how you would want to be treated,” Aboumatar says. But making these changes depends on leadership willing to drive this organizational focus. For clinicians to change, leadership needs to emphasize the value of caregiver input. “Bottom line, it has to do with creating that organizational culture that provides permission and encourages basic engagement for caregivers and allows them the support and education they may need to become more active participants in the care of their loved one,” Aboumatar says.